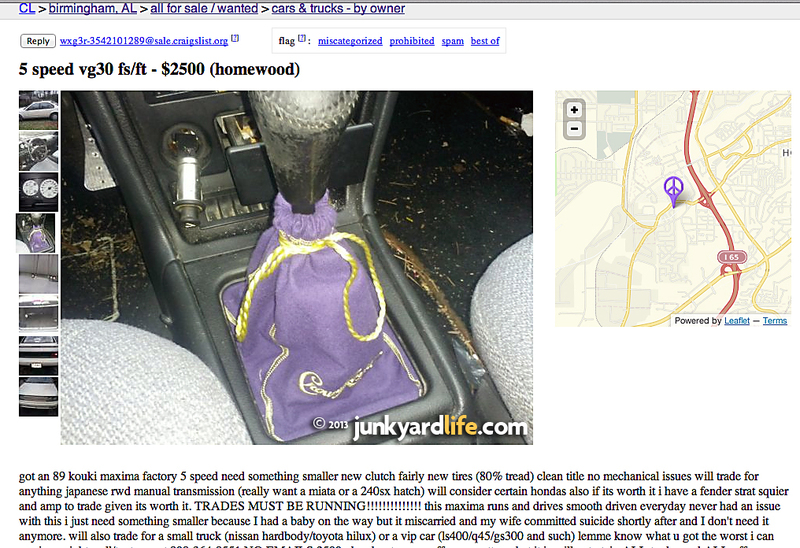 Craigslist ad offers you shot of whisky, mentions wife's suicide. Oh yeah, its a five-speed, want to shift gears? The photo alone says a lot about the nature of this Craigslist automotive ad. You know this can't end well for the seller or the buyer. Seriously? 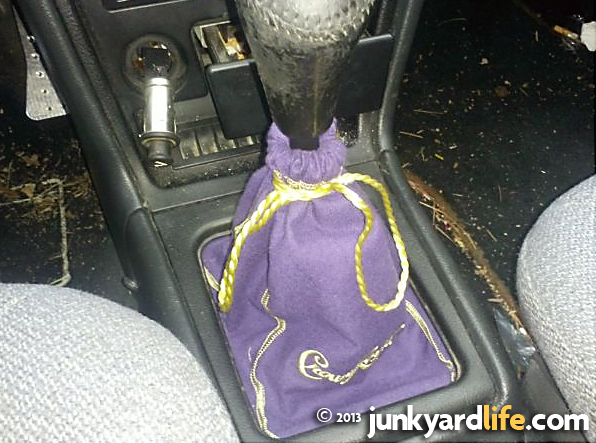 A line about a miscarriage and a suicide follows the photo of the 5-speed shifter wrapped in a Crown Royal bag. This should instantly give pause to anyone in the market for a used 1989 Nissan Maxima. The ad, which appeared on the hugely popular, classifieds website, Craigslist, is a reminder of the painful desperation that can be uncovered by scanning a few of the millions of CL ads from around the world. Consider this a lesson in car buying and selling. Don't try this at home. Placing a Craigslist automotive ad is easy. Selling a car with a poorly written and photographed ad is nearly impossible. "Got an 89 kouki maxima, factory 5 speed, need something small, new clutch, fairly new tires (80% tread), clean title, no mechanical issues, will trade for anything japanese, rwd, manual transmission (really want a miata or a 240sx hatch). Will consider certain Hondas also. If its worth it, I have a Fender Strat Squier and amp to trade, if it is worth it... I just need something small because I had a baby on the way but it miscarried and my wife committed suicide shortly after and I don't need it anymore. will also trade for a small truck..."
I'm sure the joy of shifting the Maxima's 5-speed manual transmission can never overcome the buzzkill created by this morbid Craigslist ad. Don't worry if your having trouble selling a vehicle. There are millions of cars and trucks posted for sale on the internet everyday. Plenty of those vehicles remain unsold due to inept sellers. Junkyard Life has some surefire tips for you. Don't mention the death of anyone related to the ownership of vehicle you are selling. Looks good, no dents or mismatched paint. Smells better that a trash can. Has not been used in a crime spree. Have you seen a kooky Craigslist ad? Know of a quirky junkyard that we need to visit? Send emails to junkyardbull@gmail.com. Darth Vader and the roll-up windows. 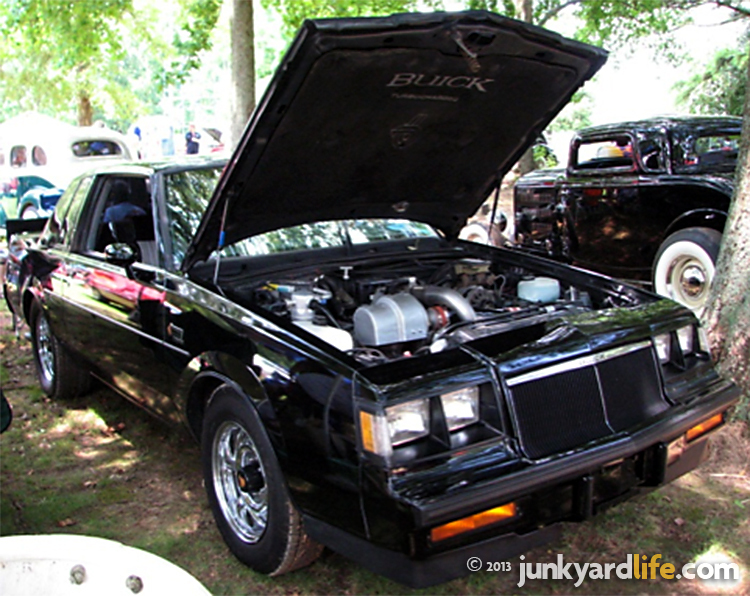 To add to Jody’s story on the original Turbo Buick – I have a question about Grand Nationals. This really should be entitled, “To Further Educate Junkyard Life on Buick Turbos.” Last weekend, during a Junkyard Life adventure, Anthony and I attended the Ardmore Car Show and swap meet. Hundreds of cars and gear heads united in beautiful Ardmore, a city at that straddles the Alabama-Tennessee state line. 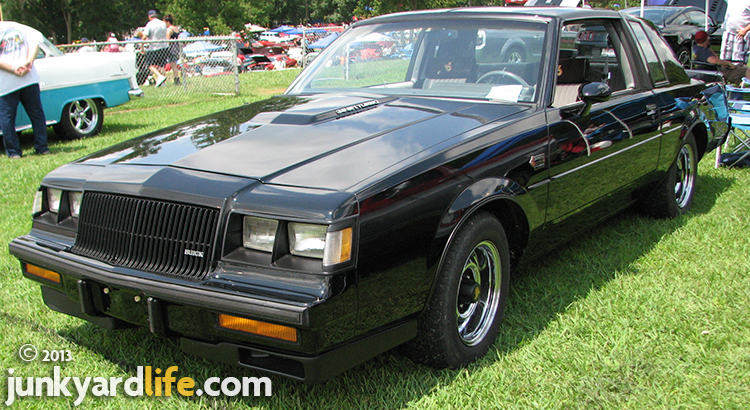 A Buick Grand National stole my attention because it was missing options taken for granted on almost every new car. I always hope to run across a turbo car from the Buick line, particularly the 1986 and 1987 intercooled models, at any show. I have a beautiful dream of someday owning a T-Type wearing grey or Rosewood paint. More on that later. There were three Grand Nationals in attendance at the Ardmore car show. That alone is note worthy! Outside of the GS Nationals in Bowling Green, Kentucky, where else can you expect to see a Buick Grand National? The three black beauties at the show were packed with options. You expect that. It was a Buick. The top of the line Buick, at that. All were super nice cars. 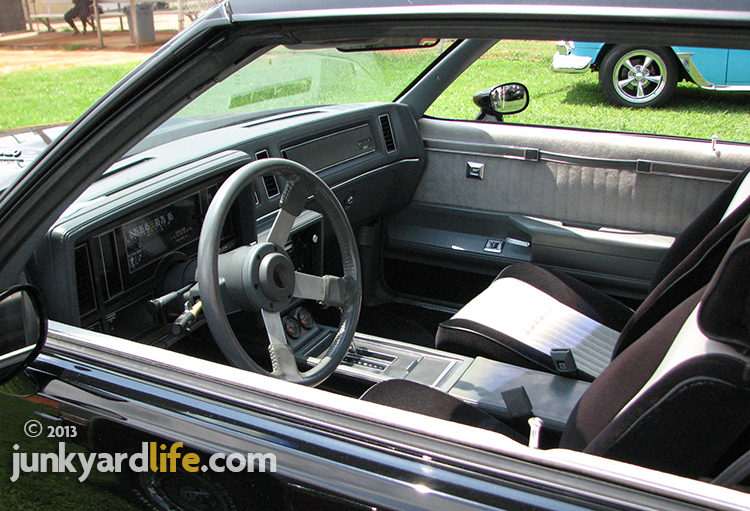 Cruise control, tilt wheel, cloth seats, special badging, air conditioning, power seats, power door locks and power windows can always be found in a Grand National. Or so I thought. I found a Grand National with manual, roll-them-up-yourself, windows and powerless door locks. Did I? I’ll take fries with that Do you expect this beautiful GN to have power everything? I did. I loved the manual windows! Surprise! Before you call shenanigans on me, look at the picture below. 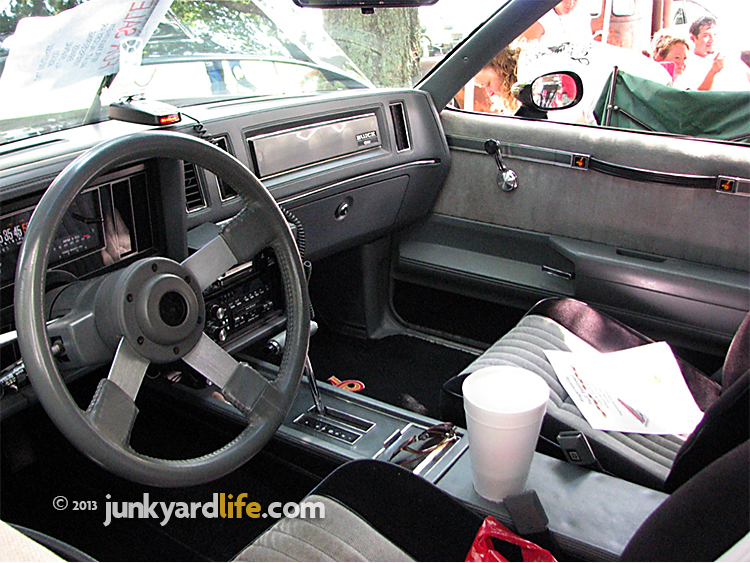 Manual windows and manual locks on a Buick Grand National! How many of these have you seen? See? See? I wasn’t making this up. Also note the Turbo-6 hardware covers on the door pull. I have seen a couple of T-Types with manual windows. That makes a little more sense. That is even believable. I have never until now have seen a Grand National with manual windows and locks. It’s like Darth Vader opening his own doors. So my question is this: "Does anyone have any numbers of these?" So send me your weird Buick Turbo option, or lack there-of, facts. We must know. Know of wacky Buick GN build numbers or a junkyard that we need to visit? Send emails to Ron at Kidd403@bellsouth.net or Jody at junkyardbull@gmail.com. A total of 30,022 Buick Grand Nationals were built during the 1982-1987 production run. Adult male, in his mid-thirties, looked at the Grand National and asked a friend, "Grand National? Is that really what they were called?” I wanted to call security and have him put in jail. Adult male, mid-twenties looking at a GN was overheard “Yeah, Grand Nationals, they were supposed to be fast, but no one has ever seen one run.” I just didn’t know what to say. Poor guy. THAT guy needs an education and not just the stats on power windows. Compare this power window switch and power lock on passenger door panel of this Buick Grand National. Tell us something about an old junkyard or rusty relic. Send emails to Ron at Kidd403@bellsouth.net or Jody at junkyardbull@gmail.com. Buy a wreck, get a deal on an LS1 engine. We say ‘thank you,’ to the ham-fisted, seat jockeys who love playing tag with guardrails and trees that get in their way. Those body panel beat-downs have killed many cars, and jacked up auto insurance premiums for everyone, but provided new life for thousands of classic muscle cars and hot rods. These engines make ideal swaps for the gas guzzling collectible parked in your garage. You want to drive your old car, right? The LS1 may be your answer. Putting a hot, late model, fuel injected V-8 engine into your old school hot rod has been done. Face it, 25 years ago, guys were dropping Tuned-Port Injection Chevy 350s into their neon-painted street machines. Those replanted TPI engines were courtesy of wrecked Camaros, Firebirds and Corvettes. TPI engines got better gas mileage and made enough torque to spin the tires. "Whoo-hoo!" It's 1988 - what time does "MacGyver" come on? Today, the go-to, best ‘bang-for-your-buck’ engine is the LS1, or Gen III small block, which was introduced by GM in the 1997 Corvette. LS1 engines produced more than 300 rwhp (rear wheel horsepower) from the factory. When new, these street fighters waged war and won against the best that the competition could offer. With a few internal mods these engines can produce 500 hp. 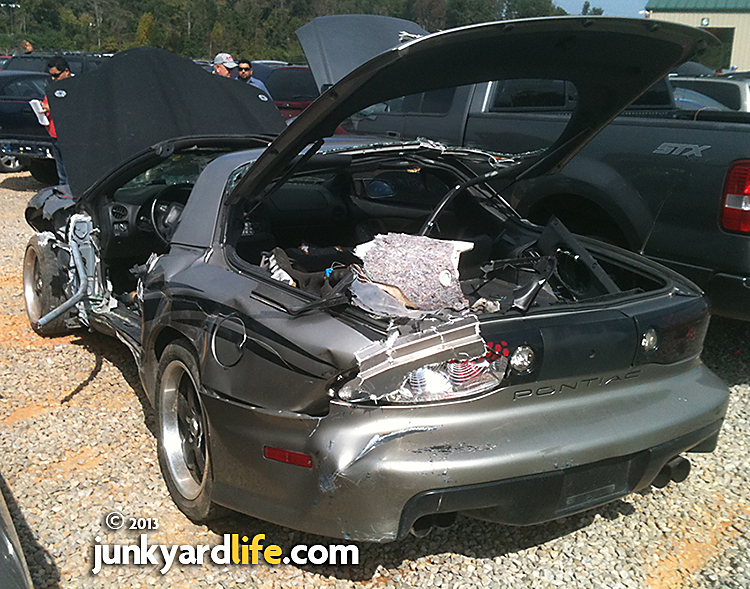 This wrecked LS1 Trans Am sold for $2,000 at an auction earlier this year. That is a screaming deal on 300 rwhp. 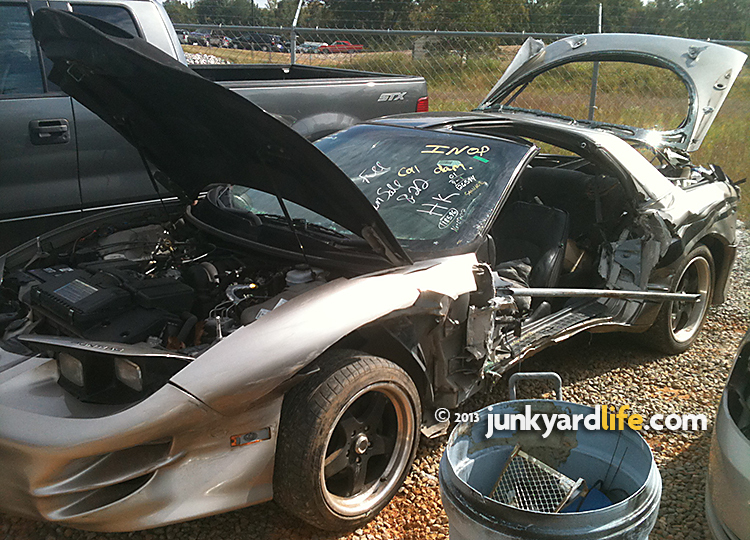 Where to look for wrecked LS1s? Most LS1 cars have racked up the miles and many have reached the wrecking yard or auto auction after years of abuse or damage. I spotted the LS1-powered 1999 Pontiac Trans Am in these photos at a recent auto auction in Alabama. It sold for a measly $2,000. The Trans Am had a complete LS1 engine and a 6-speed manual transmission along with tons of other usable parts that could be sold to recoup some expenses. Complete engines sell for $3,000-and-up on ebay. Do the math. Horsepower doesn't come cheap but this is a heck of a deal. What cars have an LS1? Now is the time to get out and score a deal on an LS1 for your next project car. Corvettes were equipped with the LS1 from 1997 until 2004. The Chevy Camaro and Pontiac Firebird offered the LS1 V-8 engine option from 1998-2002. A word of advice: you will have better luck finding an F-body (Camaro or Firebird) that has tangled with an immovable object. Totaled Corvettes are hard to find. When you do find them, they still aren't cheap. 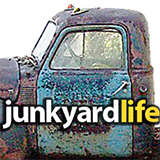 Do you have a Junkyard Life story? 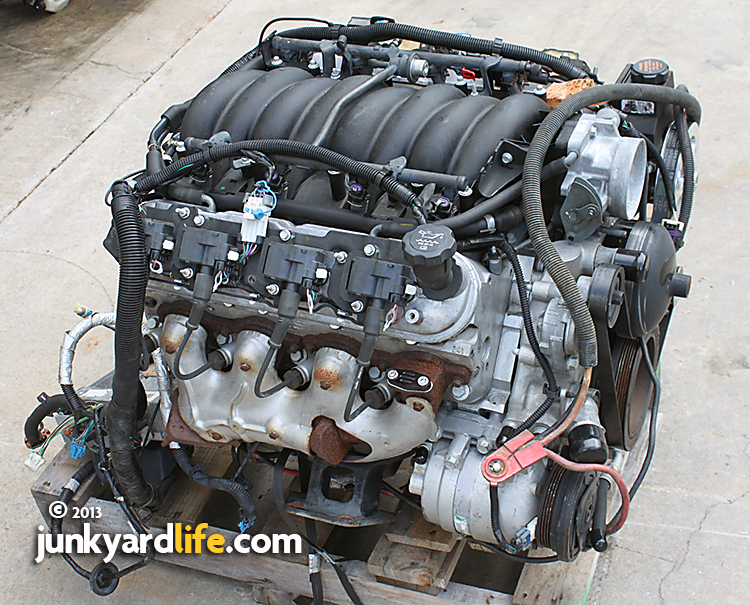 Used LS1 engines can be found on ebay and elsewhere on the Internet for more than $3,000. Some sell for more than $5,000 with a transmission and wiring harness.